Also known as chakotra, it is grown on a subtropical citrus tree. 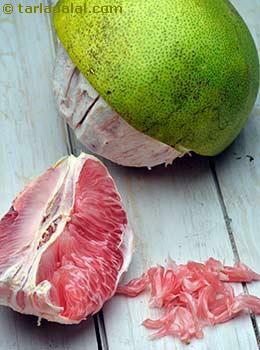 The grapefruit is a large fruit with a unique bitter taste. The outer skin of the fruit is yellow-orange while the pulp may be white, pink or red depending on the variety. The oblong fruit has a diameter ranging between 10 and 15 centimeters, while the flavor ranges from highly acidic and somewhat bitter to sweet and tart. This juicy fruit is hailed for its unique flavor and immense health benefits. The glycemic index of grapefruit is 25 which is low GI and the glycemic load of ½ cup of chopped grapefruit is 1.2. Being a good source of vitamin C, eating grapefruit is a healthier way to start your day to boost your metabolism. Is Grapefruit safe for Diabetics? The type and quantity of carbohydrate selection is very important. 45 to 60 grams of carbohydrates per meal is recommended. Hence, equal distribution of carbohydrates throughout the day will help stabilize your glucose levels. ½ cup of chopped grapefruit has glycemic load of 1.2 because the carbohydrate content is just 5 grams. This makes grapefruit an ideal fruit to incorporate in your diabetic meal plan. It is an extremely rich source of vitamin A and vitamin C which acts as an anti-oxidant and reduces inflammation. It also has the property of reducing insulin resistance to an extent. Is Grapefruit suitable for Weight Loss? Being low in calories, grapefruit perfectly fits into the weight loss diet plan. ½ cup of chopped grapefruit just provides 34 calories. You can eat this as a snack in between your meals. Remember to control your portion size.